7 lb. Size is packaged in a gallon size bucket. 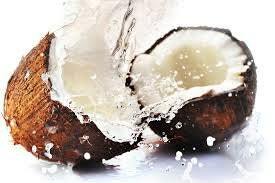 Coconut Oil , also known as Copra Oil, is a white solid fat obtained from the fruit of the coconut, widely used in food products and in the production of cosmetics and soaps. It is a very soft solid. Coconut Oil is probably the most popular soap making oil. This oil adds volumes of lather to a soap making recipe. It is also used in massage oil recipes and for a solid, spa bath oil. Aside from coconut oil, the only other source of lauric acid found in such high concentrations is in mother's milk. Tropical oils and mother's milk are by far the richest food sources of medium chain fatty acids available. The photographs that I use for my fragrance, massage, carrier and essential oils are stock photos. I am not a very good photographer and to get a good photo of the over 300 different oils I sell would take me the rest of my life. I do however give a good description of the actual packaging that you will receive them in, I also label them with good quality labels so you can always be proud to display - use or even re-sell my oils. Q. What is a carrier oil? A. Carrier oils and bases have a variety of uses and can have therapeutic uses. Carrier oils are important in the practice of aromatherapy. A carrier oil is usually a vegetable or nut type oil which is skin safe and moisturizing. I carry five all natural carrier oils; apricot kernel oil, grapeseed oil, jojoba oil, sunflower oil, and sweet almond oil. Shelf life for carriers are approximately 6 months, store out of direct sunlight at room temperature for best results. These oils can be used to make massage oils, creams, lotions, soaps, perfumed body oils, and bath oils. I also carry DPG, Dipropylene Glycol which can is used as a carrier oil. Q. What is the difference between Fragrance Oils and Essential Oils? A. Essential Oils are natural concentrated essences derived from plants, bark, roots, seeds, stems, flowers, leaves, fruits, etc. and are usually steamed distilled. Fragrance Oils normally are made up of a number of synthetic imitations of essential oils creating a fragrance that will smell like a flower, herb, plant or other fragrance. Essential oils are natural aromatic compounds found in the seeds, bark, stems, roots, flowers, and other parts of plants. Essential oils can present very pleasant aromas and very powerful aromas. Essential oils are generally extracted by distillation, typically by using steam or other processes including expression, solvent extraction, or cold pressed. Our Essential oils are most often used in soap production and aroma lamps for aromatherapy. Essential oils can also be used for adding scents to incense sticks and household cleaning products. I have a very large assortment of essential oil, fragrance oil and carrier oil. I am very slow at getting them listed. If there is something that you would like please let me know and if I have it or can get it (some are rare during different seasons), I will quickly get it listed for you. Thank you for looking at my products. Exactly what I was looking for. The coconut oil was well packaged with no leaks. Shipping was super fast. Customer service is excellent! I highly recommend this shop.